Description: Color postcard shows a young man placing just-picked shade tobacco leaves into a canvas basket. 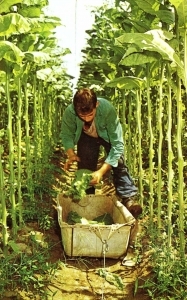 Connecticut River Valley shade tobacco is harvested in July and August. The baskets full of leaves are pulled from the field by draggers and transported to the tobacco sheds.